Today is the first day of the second week of classes here at Hollins. Last week was an unusually structured week, as my class that meets Mondays and Wednesdays 9-12 met instead on Wednesday and Friday, as Monday was devoted to all kinds of orientations: student, faculty, information technology, library, welcome reception. In the course of that first day, I got my new Hollins ID and lost it within the hour. I worried that if I dashed off to replace it right away (which I did), that would ensure it would show up ten minutes later, but it never has shown up, so I'm glad I scurried off to take care of it immediately. Later in the week I lost my office keys (subsequently found beneath the couch cushions in my now-much-cozier garret) and my reading glasses (feared to have been left behind in the laundry room but subsequently located in the outside compartment of my purse). So my entry into the enchanted world of Hollins was not without its complications. But also not without its rich rewards. I wrote FOUR (!) chapters of a work-in-progress with a looming deadline. I reconnected twice with my extremely dear friend Rachel, who worked with me decades ago at the University of Maryland (for evidence of how dear she is to me: there were twelve people at my wedding, and she was one of them). I attended two fascinating panels by alums on "Life After Hollins," both of which impressed upon me how well our graduates do in both creative and scholarly work after departing from us. I read three books. I walked for an hour and three-quarters at 6:15 every single morning except for Sunday, with two other fast-paced authors. I attended a welcome potluck at the beautiful Victorian home of our director Amanda, every square inch of it radiating creative joy and whimsy. The heart of the week, however, was teaching the first two classes in my chapter book course, where I fell in love with my seven wonderful students. Kids often call any book a "chapter book" if it has chapters, including within this designation everything from easy-reader texts like Frog and Toad to lengthy middle-grade novels like The Secret Garden. In my class we're using this terminology in its more restricted sense from the world of publishing: chapter books are books for transitional readers aged roughly 7-9 (grades two to four), books that fall precisely in between the 1000-word text of easy readers and the 25,000+ words of middle-grade novels, books that have their own distinctive pace and structure. Think Junie B. Jones, Clementine, Alvin Ho, Amber Brown. My own chapter books include 7 x 9 = Trouble, How Oliver Olson Changed the World, Mason Dixon: Pet Disasters, and most recently Kelsey Green. Reading Queen and Annika Riz, Math Whiz. Mine range in length from 10,000-15,000 words, though Knopf wanted me to make my Mason Dixon books considerably longer, at 25,000 words. For my course, I decided to try something quite ridiculously demanding. I want my students not only to read and analyze exemplar texts, as well as read a heap of other recent samples of the form, but to write an entire chapter book manuscript of their own, from idea to first chapter to conclusion (plus plenty of revision, of course), all in six weeks. It just seemed to me that chapter books are all about structure: finding the right size-and-shape of story to fit in that precise format, with its distinctively peppy pacing. I didn't think students could see what it was like to write one until they had written all of (at least a rough draft) one. On Friday we brainstormed ideas in class, many drawn from our own third grade memories. Their assignment: come on Monday with a detailed one-page synopsis of your proposed book. I had second thoughts Friday night. Several students had met with me at length one-on-one that afternoon, and I left thinking: They can't do this. It's too much. Right now, they ain't got nothin'! And the plan for the book is due in 48 hours! The synopses trickled in over email yesterday afternoon and late into the night. I read them early this morning. They're good, all of them. Some are more promising than others, some are farther along than others, but they are all chapter-books-in-embryo, ready to be written. We discussed/critiqued them in class today, and their authors proved to be insightful and supportive critics of others' work as well. Then we spent the rest of the class studying the requirements for a successful first chapter. First chapters: due Wednesday! So, it's sort of crazy, but it's sort of wonderful, too. The class seems excited that I have to write a chapter book of my own during this same time frame, and they asked if I'd bring in my chapters to share as well. I don't want to draw class attention away from their manuscripts, but I'm willing to let them take a few peeks at mine and offer their thoughts. After all, we're all in this together, committed to spending the next six weeks (well, five now), living, breathing, eating, sleeping, reading, and writing my favorite form of writing-for-children: chapter books! I've spent the last two days settling in at Hollins University in Roanoke, VA, where I'll spend the next six weeks teaching a course in chapter book writing in their graduate program in children's literature. 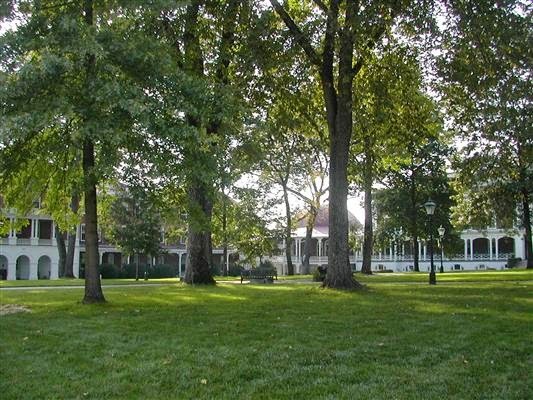 I came to Hollins in 2005 as the program's writer-in-residence, a two-week commitment that involved giving a talk, meeting with almost all of the creative writing students, and generally immersing myself in this wonderfully stimulating community. The campus is idyllic; I was housed in the darling Barbee Cottage; I walked in the evenings past trees festooned with fireflies. As I left, another guest lecturer was arriving, and I told her, "You are entering the portals of paradise." This year, however, paradise is looking a little different from what I expected. I'm not housed this time in a sweet little cottage on campus, but in a unit in the graduate student apartments across a highway. When I first saw the apartment, I almost cried. Well, maybe I actually cried. Linoleum floors. Cracked ceiling light fixture in the kitchen. No overhead lights anywhere else except the bathroom and hall. One sad lamp in the living room, on the other side of the room from the non-comfy couch. One sad lamp in the bedroom, on the other side of the room from the hard little bed. A bare, scarred table on which to eat. No pictures, no curtains (there are blinds), rugs, no welcoming "touches" at all. And I have to live here for the next six weeks. I tried to remember how much I loved Sara Crewe's bleak, bare attic in A Little Princess, where she's sent by cruel Miss Minchin after Sara's father dies, taking his fortune in diamond mines with him. I tried to remember how many times I've seen La Boheme and yearned for my own garret in Paris. But neither of those had Linoleum floors! I was in despair until my friend Lisa, a veteran of the program, living in the apartment across the way from mine, showed me how pleasant her little digs had become. I learned that those who teach here year after year keep heaps of apartment-brightening materials in the many large plastic bins they store throughout the rest of the year in a Hollins facility and haul other needed items with them in their cars. But I came by plane with only carry-on luggage, and I'm not sure I'll be teaching here again, so don't want to invest too much in furnishings. Undaunted, Lisa set to work beautifying my place. Step one: move the TV, which I never watch, into a closet, freeing a table that could be moved next to the couch, so I'd have a light for reading. She somehow found some other little table I had overlooked that could be positioned next to my bed, so I could read there, too. She turned my couch at a more appealing angle. She suggested moving one of my two empty bureaus from the bedroom closet into the living room to function as a sort of sideboard. She took me to the Hollins storage facility that contains all kinds of abandoned things: there I scored a small area rug, another lamp, a fake plant. A trip to the Dollar Store produced a cheery tablecloth, some flowered place mats to cover other unappealing surfaces, and a puffy "armchair" pillow. She noticed that I could use my extra blanket as a throw for the couch. And she showed me the bargain bunches of flowers Kroger was selling for 99 cents. My little garret is quite sweet now. I'm writing this by the glow of my new lamp, with a vase (drinking glass) of flowers set before me. (Oh, she suggested candles, too, another excellent idea.) I can now read in bed, read on the couch, type on my pretty table. So I did get my long dreamed-of garret, after all, in Roanoke rather than Paris, and with flooring that isn't what I would have chosen. But it's all going to be all right, thanks to Lisa, who served as my magician, just as the Indian Gentleman did for Sara Crewe in the book. Now all I have to do is write something worthy of it while I'm here. The Children's Literature Association conference that took place last week in Columbia, South Carolina, was the usual dizzying love fest of children's literature scholars from all over the world who came together to hear hundreds of papers, this year focusing on the conference theme of "Diverging Diversities." I sat entranced through sessions such as this one on diversity in series books: do the Oz books celebrate diversity or normativity? was the Judy Bolton mystery series as forward-thinking on race and ethnicity as it was on gender? what was gained and lost as later Boxcar Children books avoided problematic racial references by erasing race and so whitewashing their characters altogether? I was electrified by keynote speaker Kate Capshaw's stirring call for scholars to increase their research and teaching on a more diverse range of texts: "Creating a syllabus is a political act." I reconnected with a wonderful scholar friend from China, whom I had met at the U.S./China children's literature conference in Qingdao two years ago. I stayed up half the night laughing and crying with my dearest once-a-year conference friend. This year, however, the conference had a new stress for me. This year I was finishing up my year-long term as president of the Children's Literature Association. I had to run an all-day Wednesday board meeting, as well as a general membership business meeting where I would give a ten-minute presidential address, and preside over the closing awards banquet, as well as fit in brief meetings throughout to deal with any small association crises that might arise. I think I may have mentioned on this blog that I hate being in charge of things. Yet this whole past year I've been in charge of this very big and most beloved thing, and the annual conference is this thing's culminating moment. But, as so often happens with things I dread, it turned out to be all right. I had fun writing the president's address, my dauntedness reduced when our wise-beyond-her-years conference manager, Carly, told me, when I expressed my worries about it to her: "The president's address is not a conference highlight." True! But I knew that my friends would be waiting to hear what I said, and I didn't want to disappoint them. So I did my best to craft what I hoped would be a witty but also heartfelt brief talk comparing ChLA to the many famous parties in children's literature, drawing literature/life parallels regarding party invitations, party presents, party etiquette, and the need to make the party welcoming and inclusive (cf. the conference theme of celebrating diversity). For the awards banquet, my main charge from the conference organizers was to streamline what had become for some a too-long affair, as our awards continue to proliferate. I worked out a new format, and of course as soon as I did so and mentioned this to some friends, half of them said, "Who said the banquet has gotten too long? I thought the length was perfect!" But I haven't heard any complaints (yet!) about the new format where we wound up at 9:15 instead of at 10 and had that much more time for post-banquet drinks at the hotel bar. It was the board meeting, however, at which I discovered a hidden talent. Apparently, I am good at running board meetings. Several people told me afterwards that they had heard that I ran a great board meeting. I don't think I even knew that there was such a thing as a great board meeting. I certainly didn't suspect that I had any knack for running one. But apparently I do. And I did work hard this past year at trying to find a balance between being directive and responsive, and especially between my penchant for moving things along in a brisk, efficient way and also trying to make sure that everyone had a chance not only to speak but to be heard and that important issues regarding the identity and future of the organization were treated with the care they deserve. Alas (or, rather, not-alas), this is the last time in my life that I will ever run a board meeting, as I have made a solemn vow to myself that after my milestone birthday in August, I will TRULY never again be in charge of anything. So this talent, briefly exposed to the light of the world, will be hidden beneath its bushel again. Still, for one shining moment I ran what was by all accounts a very good board meeting. My hidden talent for one Wednesday in one June had a chance to shine. After two weeks of glorious idleness as I recovered from teaching Maymester, I embark tomorrow for six and a half weeks away. First I go to Columbia, South Carolina, where I'll preside, as president, over the annual conference of the Children's Literature Association, a group of some 800 literature professors and scholars, and me, their lone philosophy Ph.D. I love this organization beyond all reckoning. My long-standing love for it was my chief qualification to be elected to its helm. Whenever I attend a conference, which is just about every single year (in 23 years, I've only missed 3 times), I walk in the door of the conference venue, and I think, "THIS is my world. THESE are my people." Oh, the bliss of being with people who love what you love, and love it even more and better than you do. That said, I'm a teensy bit stressed this year at the thought of running an all-day board meeting on Wednesday and a general membership meeting on Saturday, as well as serving as host/MC for the awards banquet Saturday night. But in between the weight of my official duties, I'll get to luxuriate in the delicious papers on offer, hundreds of them, and catch up with dear friends from all over the country and world. On Sunday, my year as president done, I'll drive with a friend up to Roanoke, where I'll spend six weeks teaching in the graduate program in children's literature at Hollins University. I spent two weeks there as a writer-in-residence in 2005, and when I arrived I knew I was entering the portals of paradise. The class I'm going to teach has SEVEN students in it. I'm teaching what I know best in the whole world: chapter book writing (books for second-fourth graders, transitional books to take kids from easy readers to full-fledged middle-grade novels, books like my How Oliver Olson Changed the World, 7 x 9 = Trouble!, and Kelsey Green, Reading Queen). The class meets Mondays and Wednesdays, 9-12, so I should have heaps and heaps of time for my own writing, which is good, as I have heaps and heaps of writing I need to do. But there will also be time to play with other writer friends, as well as friends from my University of Maryland days, who will be joining me in Roanoke for a mini-reunion. Part of me almost wishes I weren't going off for this delectable summer of fun. I should be here in Boulder, getting ready to make a Serious Plan for my Wonderful New Life. But then I remembered: part of my plan for my Wonderful New Life is to have lots of gigs just like this one. I need money, and I love teaching, and I adore being in the company of other writers. So I'm not postponing the start of my Wonderful New Life. This IS the start of it, right now. One week into my post-professor life, I can already see that I'm going to need to think harder about how to structure my days. When I was teaching at the university, I taught MWF and worked at home on Tuesdays and Thursdays: writing, reading, grading, occasionally connecting with friends. I always woke up on MWF with a sense of impending doom: teaching is like improv theater, where anything can happen, students can open their mouths and say anything, and you have to be able to deal with whatever comes your way with grace and aplomb. Even after more than twenty years of doing it, it was scary every single day to get up knowing that I had to do it yet again. On Tuesdays and Thursdays, I woke up with eager anticipation as I beheld the meadow-like expanse of time stretching out ahead, all those blissful hours to fill however I chose to fill them. What I conveniently forgot, however, as I decided to move forward to this new stage of my life, is that while I was always happier on Tuesday/Thursday mornings, I was always happier on MWF evenings. It was so satisfying to come home at the end of a day of classes well taught (95 percent of the time they turned out just fine), stimulating conversations with students and colleagues, even meetings attended while scribbling poems on the back of the meeting agenda. I could cross off those days with smug self-congratulation. But so often I squandered my Tuesdays and Thursdays and had nothing at all to show by suppertime. I'm in squandering mode right now, I fear. Last week I did have some delicious, long-awaited get-togethers with dear friends. I knocked off a few piddling work tasks: wrote a couple of short book reviews, faced some thorny issues for the upcoming Children's Literature Association conference, and packed up a few years' worth of manuscripts to send off the Kerlan Collection at the University of Minnesota where my stacks of handwritten scribbles are archived. I lost two pounds - go, me! But I also strained my eyes at my old vice of Sudoku and felt at loose ends for hours each day. Reminder to self: I did NOT leave my career as a philosophy professor to play Sudoku. So I need a better plan. Luckily, I adore making plans. I'll schedule writing dates. I'll read Improving Literature. I'll take our little dog Tank on more walks. I'm consulting with my wonderfully creative friend, Cat, to find out how she fills her days. I'm going to talk to other full-time writers to find out the same thing. Fortunately, this is only intermission. Or maybe a better analogy would be: I'm trying out the final act of the play in New Haven before taking it to Broadway, figuring out what works and what doesn't. When I turned in my Maymester grades on Friday along with my Philosophy Department office keys, I pulled down the curtain on what I'm calling Act II of my life. Act I was my first thirty years: being an intense, passionate young person in elementary school, middle school, and high school, heading off to college and graduate school, falling in love with philosophy, falling out of love with philosophy, falling in love with various boyfriends, falling out of love with them (or, more often than not, having them fall out of love with me). I dropped out of graduate school at Princeton to take a job at Four Winds Press/ Scholastic in NYC, where I published my first children's book. I left that job to take an editorial position at the Institute for Philosophy and Policy at the University of Maryland. As my thirties ended, I had met the man I was about to marry (though along the way we broke up and then got back together again, as that seems to be one of the tropes of my story). Act II was the next thirty years of my life. I married and gave birth to my two boys and helped them grow up. I fell back in love with philosophy, defended my dissertation, and was hired as a professor by the University of Colorado, where I taught for 22 years, earning tenure and publishing a respectable but not brilliant number of articles in the field of ethics. I earned a master's degree in library science along the way, which introduced me to the scholarly study of children's literature; I ended up publishing more articles in children's literature journals than I ever had in philosophy ones. I had a "crisis in my mental history" (to borrow John Stuart Mill's famous phrase) occasioned by a crisis in my family life and emerged a stronger, kinder person, more willing to accept the advice of my beloved Epictetus to focus my energies on what is up to me rather than what isn't. I published my fiftieth children's book this past spring. This past spring I also held my first grandchild in my arms. And two days ago I irrevocably surrendered my university tenure to pursue a career as a full-time children's book writer. Now Act III awaits, which everyone knows is the best act of all, in which multiple plot lines converge in a stunning climax in which all is revealed and made right. First, though, comes intermission. I'm not planning to raise Act III's curtain until my 60th birthday, August 21. During intermission, I'm going to be scurrying around backstage to get the scene set for the final act of the play. I'm going to use intermission to focus on getting myself into physical, mental, emotional, and spiritual shape for Act III, starting with the area that needs most attention: the physical, embodied dimension of my life. My broken foot last March was a wake-up call. So between now and August 21, I'm going to lose 10 pounds (and then try not to regain them, as I've lost those same 10 pounds twice before). I'm going to develop a fitness program (in addition to my daily hour-long walks) of a whole - gasp! - TEN MINUTES A DAY! I dragged out the two-pound dumbbells I purchased a few decades ago. I had some gorgeously fit church friends show me how to do lunges and squats after worship on Sunday. I did some situps for the first time in as long as I can remember. I have satisfying aches already to show how much I've accomplished in just two days. So that is the plan. I wish I hadn't let myself slide into such chubby, flabby, sloppy physical decline, but oh, well. To quote the title of my favorite inspirational Barbara Sher book, It's Only Too Late If You Don't Start Now. I've started. Intermission will run for June, July, and the first three weeks in August. Then the lights in the lobby will flicker to signal that the best act of all is about to begin. Do any of you remember the motivational slogan from a few decades ago: "Today is the first day of the rest of your life"? Well, today that is especially true for me. Today is the first day of my life as a professor emerita and full-time children's book writer. Today is also the first day of the summer worship schedule at my church, St. Paul's United Methodist Church in Boulder. We've moved worship time from 10:15 till 9:15 so that we can gather together in the earlier morning coolness. We've moved the pews to create a more intimate space in the front of the sanctuary. We're singing more songs from The Faith We Sing rather than the (beloved) standards from the hymnal. Out theme for the summer is "We dream, we grow, we share God's love." As part of this theme of "growing," we each received a tomato plant to take home with us, as well as a little supply of (organic, meaning very smelly) plant food. I chose patio tomatoes that can grow in a container on my tiny deck. Whether my plant dies immediately as has been the fate of all plants ever entrusted to my care remains to be seen. But I'm cautiously hopeful. 'Til the rain comes tumbling down. I wept as they sang it. I love this song so much. It's been the mantra of my whole life so far. This is how I've written all my books, word by word, page by page, an hour a day. This is how I've built everything I value in my life, in small steps, inching forward. And now it's how I'm going to navigate the rest of my days. Dear God, bless my little tomato plant and help it grow. Bless my sweet grandbaby, Kataleya, and help her grow. Bless the words I write, one after the other. Bless the years that will pass, unfolding to me one day at a time. May I use them in your grace and for your glory.